Choosing the right type of chickens as well as the best type of animal housing is a process which is given much thought and care. It is also vital for your bird’s health that you take a good look at how your feed is kept and being accessed. To keep your flock healthy, a chicken feeder which is rat proof is crucial. Rodents are carriers for some nasty diseases, many of which may be passed on to Chickens. At the end of the day, uneaten feed should be put into containers with lids for storage (or use an automatic chicken feeder). Use a rat proof automatic chicken feeder like this one to ensure that feed containers can only be accessed by your chickens. Mice and rats can squeeze through holes as small as a coin- ensure that there are no small gaps or holes in your chicken house. Remember, mice, rodents and rats are after food, not your chickens. They come into chicken coops in search of food. The easiest way to prevent them is to remove their food supply by making sure that your poultry feeders are rat proof and they cannot gain access to feed. Diseases can be spread to chickens directly through contact with rodent feces, urine, or saliva, or through rodent bites. Diseases carried by rodents can also be spread indirectly, through ticks, mites or fleas that have fed on an infected rodent. An article on the ABC (US) news website states that More than 49 million birds died or were euthanized during the recent Bird Flu outbreak this spring in the USA. While Scientists determined that wild birds introduced the virus onto farm, it is believed that the virus was then spread by Rodents. Mycoplasma: Is a disease which cases breathing difficulties, sneezing, and swelling around the eyes and nose. Necrotic enteritis: It is often found after a hen has been infected with another another intestinal disease such as coccidiosis. It can be found in mouldy feed, or wet feed which has dried and become caked on to the feed bowl. Coccidiosis: Is one of the most common killers of young birds. It is caused by a parasite of the stomach. It’s main symptom- although not always present is blood in the droppings. Infectious coryza: Is a common bacterial infection. It’s symptoms include breathing complications and it can cause depression and sickness. Fowl cholera: Also known as Pasturella, this disease is very common. It is spread by wild birds and rodents, and often occurs when birds begin to start laying. Erysipelas: Is usually characterised by sudden deaths in young birds. In recent years it is increasingly being diagnosed in flocks of chickens, however it begun as a disease mainly affecting turkeys. “Hi there, this is the second one of these feeders I have bought from you. The last one was in 2014. BRILLIANT!!! Chooks got the hang of it within a few weeks. I have now got 6 new chooks and I thought I’d have to go through the whole “learning stage” again. 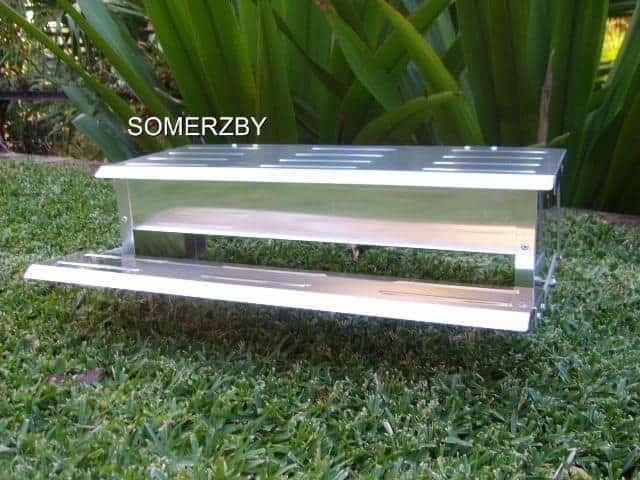 The Somerzby chicken feeder is easy for your chickens to learn to use. The lid is lightweight and closes slowly so it will not hurt your chickens, and it will protect your feed from pests, rain, vermin and wild birds. It is made from long lasting rust-proof aluminium. You can view more of our rat proof chicken feeders reviews here. 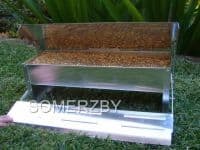 You can buy a Somerzby chicken Feeder here. This entry was posted in Chickens and tagged chicken, feeder, healthy, pests, rats, rodents.